No one else is allowed in the cellar. Recommended by Kameron Hurley here and by this metafilter thread. Also part of my Once Upon a Time 9 reading, this, to me, fits within folklore, fairy tales, and fantasy, although its gothic horror feel also makes me think it would make for a good RIP read too. Lizzie Borden is infamous. Accused of murdering her father and her step-mother with an axe, she was put on trial but acquitted. Nevertheless, when the people of Fall River think of her they think of an axe murderer. Now she has moved across town and lives with her sister. An isolated life, almost hermit like. Their few visitors include Dr. Seabury, as Emma, Lizzie’s sister suffer from consumption. From time to time they also welcome Nance, an actress who is Lizzie’s lover, although Emma doesn’t really like her. And then there are the unwanted visitors. The strange monstrous creatures that seem to come from the sea and must be destroyed. Chopped with Lizzie’s axe and their bodies deposed of in the “cooker” the Borden’s have installed in their secret laboratory in the cellar. I’ve never read any H.P. Lovecraft, but this books feels like everything I think of when I hear “Lovcraftian”, monsters from the deep, unexplained horror, and an overwhelming sense of dread. It is just a wonderful book. It is told as a series of journal entries from various characters, as well as the occasional letter and report. So everything is told in first person narration, well, almost everything, I think there is a newspaper article or two in there as well, and there are a variety of POV characters. Elizabeth Borden herself, her sister, their friend the doctor, being the main ones. Through them we learn just why Lizzie took that axe to her parents, and why she continues to carry it around. But nobody really knows what is going on. They are doing their best to fight whatever these creatures are, whatever this infection is that seems to be taking over more and more people, wreaking more havoc, not just on Fall River but spreading much further than that, but they don’t know where it comes from or how to stop it. Everything is trial and error. Some things work, like the old folk tale of iron keeping the fae away, although these invaders are nothing like fairies, but others seem to have little effect. But as well as the battle against the ocean and its monsters Lizzie, Emma, and all the others also have all the usual interpersonal relationship issues that any group of people might face. Emma is almost bed-ridden, she is dependent on Lizzie, and resents Lizzie for that fact. Lizzie is madly in love with Nance, but won’t trust her enough to tell the truth, and Dr. Seabury is an outsider but with his own personal issues to battle. The interplay between all the characters is just wonderful, you can empathise with each and every one of them, wanting them all to get along while understanding that sometimes issues don’t just get sorted out. 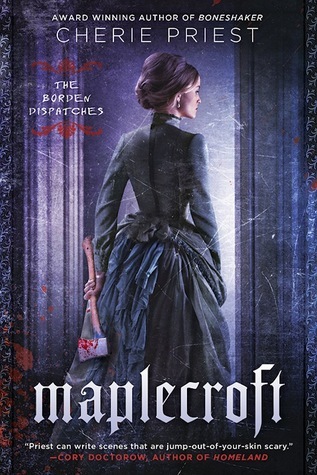 Maplecroft is an awesome book and I’d highly recommend it. It is the first book by Priest I’ve read although I have heard her spoken of highly of before. The second in this series, Chaplewood , is expected out later this year. It is one that is certainly being added to Mount TBR. You should probably read it too! Oh oh! I want you to try her Boneshaker. I really liked that book — the hero was a lady who was a mother, which I found fascinating. See, now, this is how TBR piles turn into Mountains. I finish one book and straight away add two more! I really enjoyed Boneshaker, I really should look to read some more of her books.